The Fife Fancy’s small size is the main thing that distinguishes it from the Border Fancy Canary. Some even refer to them as miniature Border Canaries. Over the years the Border Fancy Canary breed and show groups have been working hard to increase their size. The Fife Fancy is never accepted over four and a half inches (11cm) in length. This is the standard. Larger versions are not accepted for show. Size is perhaps the most important thing when being judged for show as it accounts for 25 out of 100 possible points. The fife fancy has a rounded chest covered in fine, firm, close lying feathers. Their wings are compact and are carried close to the body. They have a rounded tail and small round heads. Their color should always be rich, soft and pure. The tint should be even throughout. Fife Canaries will only lay four or five eggs at a time. Canaries eat greens or seeds, and do well in warmer climates, although they can live in colder climates. The history of the Fife Fancy is well known since they are a newer canary breed. First developed in 1951, the Fife Fancy was created to bring the Border Canary back to its original standards. Initially the Border Canary was not a large canary, its original idea only measuring four and a half inches. Over the years a number of breeders began breeding their lines to increase size and bulk of the Border Fancy Canary. Some Scottish breeders took a stand against this movement and this was the beginning for the Fife Fancy Canary. 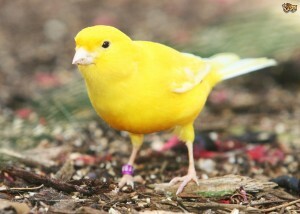 The name Fife Fancy Canary stems from the fact that all of the original people involved in this breeding program were from Fife Scotland or the surrounding area, though initially they were shown as regular Border Canaries or some dubbed them miniature Border Fancy Canaries. Their popularity has continued to rise since the 1950’s. 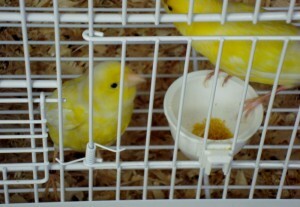 Today they are the largest canary class at most UK shows and the most popular canary seen at German shows.